New cookbooks on Asian cuisines are much easier to find now than in years past. 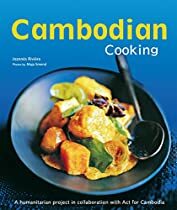 However, it’s still very difficult to find a useful cookbook that focuses on the foods of Cambodia. Now, for the first time Cambodian Cooking brings a previously untapped culinary tradition to the table for everyone to enjoy. Influenced over the years by a wide variety of cooking styles, Cambodian cuisine presents a particularly broad range of flavors to surprise the palate and stimulate the taste buds. Salty and sweet, downright bitter and sour go hand in hand or are blended subtly, sometimes within a single dish, to create a deliciously harmonious and original result. The recipes included feature favorites such as Curry Fish Cakes, Consomme with Caramelized Beef and Star Anise, Stir-fried Chicken with Chilies and Cashews and Banana Sesame Fritters. Also included is an ingredients section that includes the Cambodian names as well as the Vietnamese or Thai names of the ingredients whenever necessary for ease of shopping. Take a chance and try a whole new cooking experience with Cambodian Cooking! Cambodia was a country at war for many years.Genocide claimed millions of live and orphaned and deprived many children.Antipersonnel mines still threaten their safety and yet despite these bleak conditions, Cambodian children still smile.If you visit Cambodia, you’ll still find people who know how to open their arms in welcome. The French association Act for Cambodia founded and now runs the Sala Bai Cooking School.This association has been helping Cambodians since 1984, when it brought aid to the crowds of refugees crossing The borders of Thailand to flee the cruelty of the Khmer Rouge and all the terrible events that struck their nation at that time.